I don’t know why, but I just can’t seem to keep track of my jewelry! It seems like every couple months I am back at Forever 21 (It would be much more often if I lived closer to one) buying a few new pairs of earrings because I suddenly can’t find a match! I suppose part (all) of my problem might have to do with the fact that don’t really have a designated place to really put my jewelry when I take it off. It ends up on the bathroom counter, my night stand, the TV stand, next to the kitchen sink… Really, anywhere but where it should actually be. I think it’s about time I DIY a nice place for all my jewelry to live so I can have it for more than a month or two. This one is awesome if you have a ton of earrings to hold, especially dangley (is that even a real word?) earrings, but they didn’t forget studs, if you look closely you can see at the bottom there is a ribbon to hold all your stud earrings too! 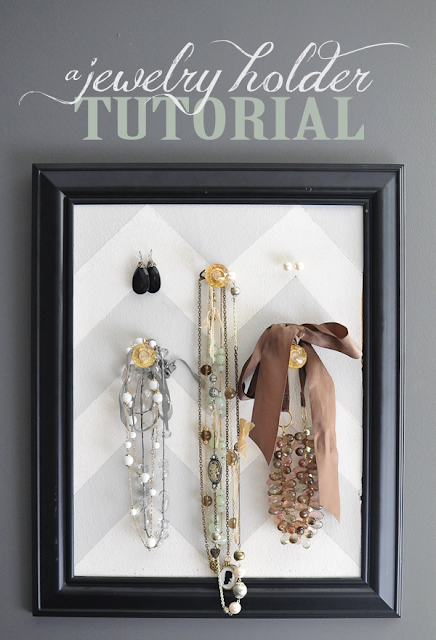 I sort of just want to make myself one of these super easy/super cheap jewelry holders just so I can look at my necklaces and earrings luxuriously draped over the sides. Yup, I’m doing it. I LOVE this! Unfortunately, the site where I found this picture on is not in English! 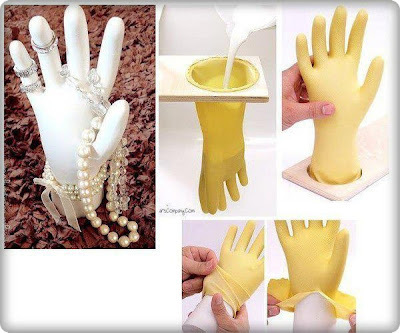 I am going to have to figure out how to make one of these bad boys, I see a tutorial (in English) in my future! This would be so fun to have, it is quite the display! You could even put a mirror in one of the spaces if you wanted to. 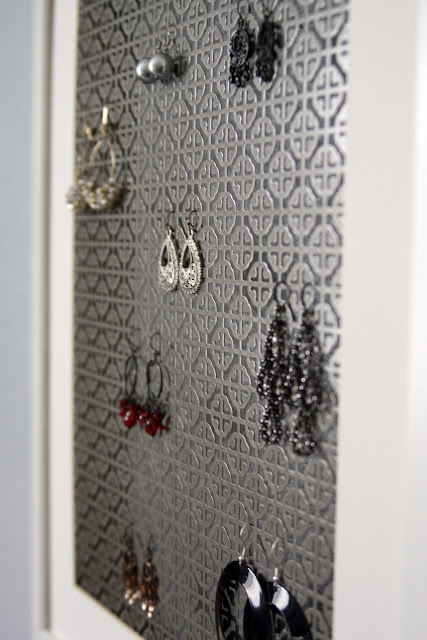 I love that this is cork board and you can stick your earrings right into it. The maker of this jewelry holder painted their cork board chevron, but this is so customizable because you can paint it however you want! The maker of this pretty little thing covered a piece of plywood with burlap and stenciled on the design, but I don’t see why you couldn’t just use any fabric you wanted to cover it, or skip the fabric and just paint. 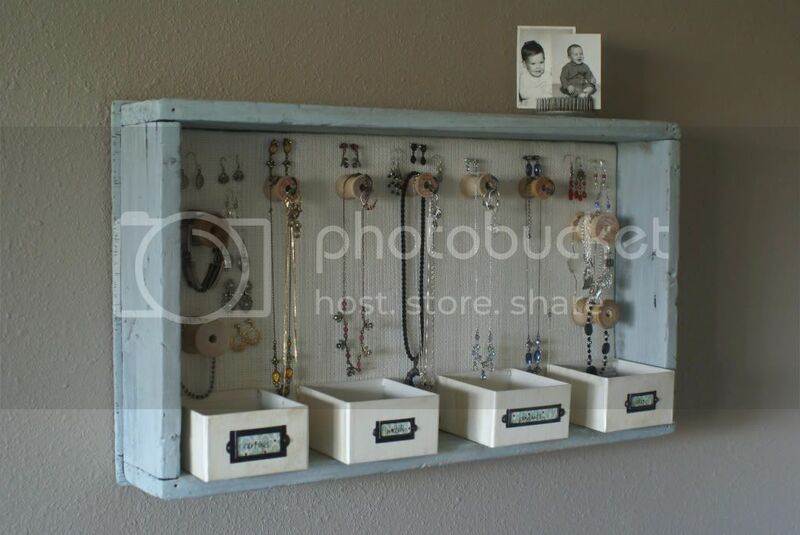 This one is super cute, and it would be so handy to have those little boxes to store you’re miscellaneous extras. Next time I am at Home Depot I will definitely be checking out the decorative radiator grates. I never even knew such a thing existed, but how cute is that?! I would love to have one of these little frames on my nightstand or bathroom counter for those occasions when I forget I still have earrings and gotta take them off. This one was made by yours truly! I thought about making a tutorial, but it was way to easy to even bother with that. I found this little frame for $2 today at Michael’s and immediately knew what wanted to do with it. It was originally pink but it broke when I opened it to take out the plastic. I used epoxy to put it back together then spray painted it gold. I have seen people do all sorts of things for the background, I just went with paper because I love easy. Last I shoved in a nail, no hammer or anything, and used lots of hot glue to keep the nail from spinning around. Super easy and now I have a pretty little place to hang my ring! 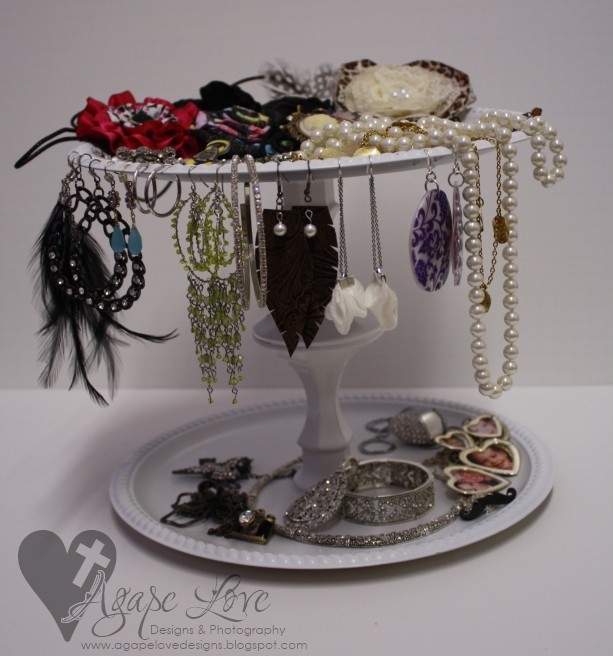 This entry was posted in DIY, Jewelry on January 27, 2013 by Heather. Hi, I was looking for some diy ideas to organize my jewelry and I really like the Window frame jewelry display… I think it looks very pretty and it has a lot of space. I clicked on the source link but failed to find the instructions on how to create the window frame.. is there another link where i can see how to make this display? Thanks.